It was the perfect setting—the bales of hay, the American flag on the barn, the simple folk cupping their ears to hear history being made. The perfect setting for Mit Romney (now calling himself Tim, applying his turn-around wizardry, or flip-floppery—either is correct—to his very own name) to announce his latest run for the White House. And Tim was looking great, his white shirt unbuttoned, his all-American jaw jutting without apology, his hair, despite the several dabs of Brylcreem, ruffling in the afternoon breeze. There was something old-fashioned, even nostalgic, in the scene. It reminded several of the old-timers, squinting at Tim with toothpicks clamped in their dentures, of the good old days, when politicians would roll up their sleeves, wave their arms like windmills and raise their voices to a stirring pitch of patriotic fervor. And I knew it was a big mistake for Tim to go casual. He just isn’t a casual guy. Without his suit and tie, Tim looks as uncomfortable as a dog wearing a dress. It just isn’t him. I remembered our days in Paris together, when Elder Romney thought he could be a more diligent missionary if he traded in his standard missionary attire—short-sleeved white shirt, clip-on polyester tie—for a Frenchified black turtleneck sweater and raffish beret. It might have worked if he hadn’t also insisted on wearing his black and white missionary badge, which, by the way, he polished every night after writing in his missionary journal, memorizing another chapter from the Book of Mormon and downing a shot of brandy. Elder Romney soon went back to the standard attire, but he always retained a fondness for berets, as evidenced by his insistence on wearing his yellow Olympic beret even after the closing ceremony of the Winter Games. In fact, Tim wanted to wear a beret on the farm here in New Hampshire when he announced his candidacy. “Wouldn’t it be neat if I tossed it into the ring? A symbolic sort of thing?” We were able to talk him out of that, but we weren’t able, unfortunately, to dissuade him from peppering his speech with jokes—very lame jokes that Tim thought were hilarious. Right from the start, they fell flat, like the one about the single mom who missed work just to come out to the farm and see Tim throw his hat into the ring. “Glad you’re here,” said Tim. “And don’t worry, we won’t tell on you.” This quip and others were met with blank looks from the crowd. I flashed back to our days in Paris when Elder Romney got the idea he was some sort of comedian. He was a big fan of Henny Youngman and would drive everyone at the mission home nuts by playing an album of Henny’s greatest jokes. “Take my wife—please!” Henny would say for the two hundredth time, and Elder Romney would slap his thigh and nearly fall off his chair. Pretty harmless as long as it was in-house, but out on the streets Elder Romney’s penchant—paw-shaw, in French—for jokes became a problem. He was finally called on the carpet for trying to inject a little humor into Joseph Smith’s account of his First Vision, where God and Jesus appear in a pillar of light and introduce themselves, as if there would have been any doubt who they were. Elder Romney was giving the pitch to a belligerent crowd who had gathered on the Champs Elysees. I won’t even mention how Elder Romney screwed up the punch line in the joke about the guy who walks into a bar with a 12-inch pianist. 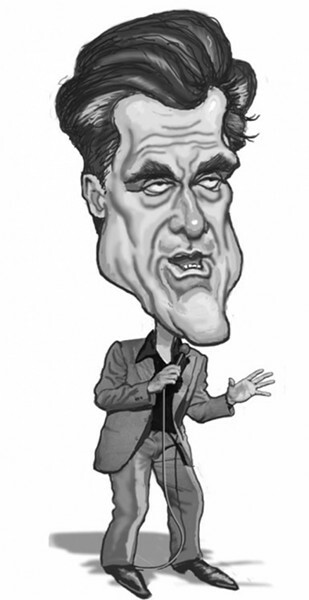 In any event, after Tim’s big flop in New Hampshire, it’s back to the drawing board for all of us on Team Romney. We’re going to have a tough time talking him out of using canned laughter at campaign stops. But Tim is determined to bring out the whoopee cushion when he debates Sarah Palin.